All Aboard the PINK PARLOUR + Giveaway! Congratulations to my Pink Parlour family for a very successful, unique and fun press launch/ blogger event last last week at their SM North Edsa branch! I love events that have themes and were thoroughly planned. So congrats Nino! :) Here are photos from that fun night. The place was set up as if we're really going for an airplane ride to somewhere. Cute! Opa Gangnam Style!!! Woop woop woop! Haha. Crazy! 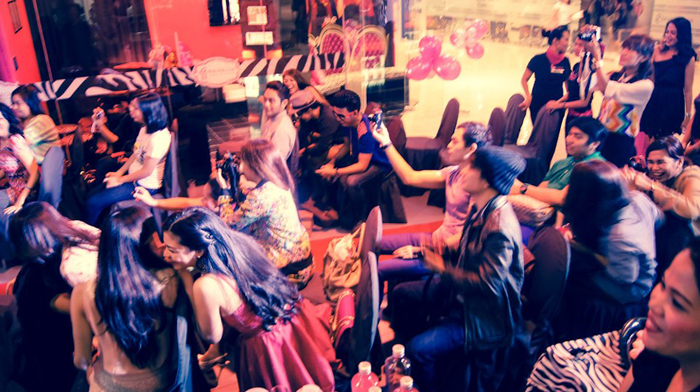 AWARD-winning salon Pink Parlour, finally arrives in Manila SM City North Edsa! Pink Parlour has transformed the Singaporean Beauty and Waxing industry with their vibrant decor and famous painless Brazilian waxing with six locations across the sunny island since 2005. Gorgeous owner Wendi Chan! She looks like Lara Quigaman noh? As with all Pink Parlour outlets, this new addition promises guests’ total indulgence, with their topnotch services complete with warranties, delivered to you by their highly trained and friendly crew. Set in a fun and relaxing ambiance with a built in area of 1000 sq ft, Pink Parlour SM City North Edsa proudly presents you with 6 nail zones, 4 waxing suites and a spray tan cubicle, enough to pamper your every whim. Wow! we were all given a passport and a boarding pass. cute! wild spray tan demo by the owners themselves! we were all cheering and screaming our lungs out. kaloka hihi. this is us oh. Hehe. this is the point of disembarkation. meaning we were then lead inside for our treatments! Yipee. Tin, Ana and I got drawn to their nails area. So that's what we availed! The others? Visit their blogs. Hehe. this is what greeted us! so cuuute. Tracy after her waxing sesh. She cant stop raving about it! Will try it out next time. Hihi. After our treatments, we were then called outside for a quick raffle! Mikyle won the waxing set. Haha naks! Looking fabulous has never been easier. Step into the rebellious sister of beauty parlours, and experience PINK PARLOUR’s girlie groove which offers the latest and hottest personalized beauty fixes to satisfy your every whim. Welcome on board and enter into our interiors that spell girlie fun, entertainment and lux pampering! Pink Parlour operates daily between 10 am to 9 pm during weekdays and 11 am to 9pm during weekends. All their multiple Award Winning treatments including Waxing, Nails, Alpha-Light Hair Removal and Spray Tanning can now be experienced right here at their latest craft which hangers at Gate #500a-500b ANE The Block, SM City North Edsa Pag Asa 1, Quezon City 1105 Philippines. And now, a giveaway for my adventurous reader loves!!! One of you could win 1 Brazilian Waxing session + Five P100 discount vouchers! 2. Download their buy 1 get 1 poster or just save the photo above. 3. Upload it on PINK PARLOUR's Facebook wall and tag as many friends as you can. 4. Facebook tagging has a limit of 50 tags per photo. You can re-upload as much photo as you want on PINK PARLOUR's wall and tag more friends. 5. Facebook fan with the most tags will win. Contest will run from November 21 to November 30 only. Announcement of winners will be on December 1. Goodluck!! !